David was born on December 18th, 1948. 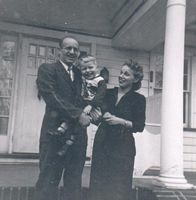 David 's father was Fredrick Otis Clauss and his mother was Helen Louise Granberg. His paternal grandparents were Samual Albert Clauss and Helen Mae Small; his maternal grandparents were Wikter (Victor) Granberg and Margaret Olivia Hogue. He has a brother and a sister, named Charles and Peggy. He is the oldest of the three children. David attended UNM at University of New Mexico part time from January 10th, 1975 to August 15th, 1980 for a college course in Industrial Computer Education. He achieved a pass. He attended George Washington High School full time from 1963 to 1967 at high or secondary level in Indrustrial Arts. He achieved a pass. He attended Comp TIA from 2008 on a professional or technical course in Comp TIA A+ Server+ Linux+. He achieved a pass. David 's occupation was Teacher in education in CNM. David has been living at David Clauss House from August 1st, 2002. Telephone: 505-293-2052 Mobile: 505-353-2171 Email: dave@clauss.us Web Site: http://david.clauss.us. He lived at Los Chavez House for twenty-three years, eleven months and seven days from September 25th, 1978 to September 1st, 2002. He lived in David Clauss San Bruno House with Pool for three years, zero months and twenty-nine days from June 1st, 1971 to June 30th, 1974. Telephone: 505-293-2052 Mobile: 505-463-6263 Email: dave@clauss.us .